NEW YORK—The entrance is small and discreet, with nothing but a paper poster plastered on the front door. But you’ll have no trouble finding Smorgasburg. Just follow the crowd. A rusty stairway leads to a 50,000 square-foot warehouse that is the new home to Smorgasburg’s 75 food vendors (and Brooklyn Flea’s 125 vendors) as of this past weekend. Despite an increase in vendors and customers, a significant difference between Smorgasburg’s new location and its previous Brooklyn Flea location is that there is much more space to shop and eat. Shoppers strolled along vendors separated by open spaces, as diners ate on wooden crates in the back. A notable new vendor is Inglorivs Kaburayvs, serving a traditional Japanese dish called kabura mushi. It’s made with steamed New Zealand seabream with grated turnip, dashi broth sauce, and fresh wasabi. It takes five minutes to make in front of you in a shiny steamer. Each bite is a different gastronomical experience. There is a tinge of lime, melded nicely with the neutral dashi broth. It has a hint of wasabi that brings an exhilarating surprise. The fish is fresh. The talented chef and owner is Mirai Kimura, who had been a consultant to Manhattan’s Sapporo, a ramen noodle restaurant. Inglorivs Kaburayvs is managed by the same people from Inglorivs Yakitorivs, known for Japanese street food. It’s a simple yet ingenious idea. Bagley, former interior designer turned baker, sells 14 bruffins that represent the cultural flavors of 14 countries. The Spanish bruffin is made with chorizo and manchego; the French with brie, herbes de Provence and gruyère; and the American buffalo chicken and blue cheese (of course). The business started two and a half years ago. This is its first weekend at Smorgasburg. According to Bagley, when he was being evaluated as a potential vendor, the decision maker ate seven bruffins. “They couldn’t get enough,” he joked. Without a banner, Thirst Tea is a hidden gem. But it shouldn’t be. It serves bubble tea ($5) in glass jars and you get to keep the jar. It serves an impressive menu of bubble milk tea with healthy, original flavor combinations, albeit the tapioca was a little undercooked. Thirst Tea uses local honey. I highly recommend the honey lavender tea, which can be served with milk or plain, hot or cold, and with or without tapioca or grass jelly. It’s is a soothing mix with the milk and tapioca. 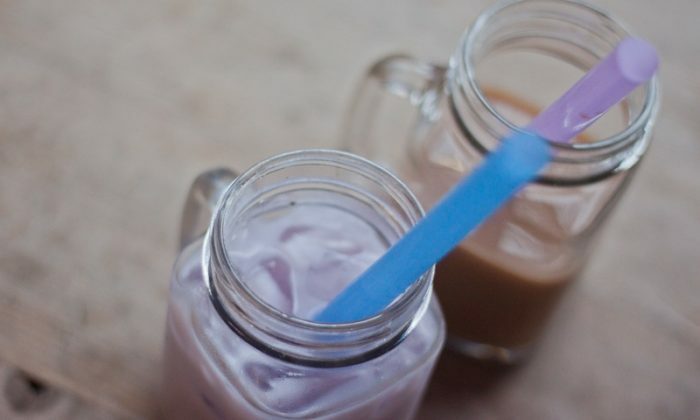 The taro coconut tea is also a must-try. The taro accentuates the richness of the coconut and Im told the skim chai latte is also very popular. Bamboo Bites opened this May, serving a diverse range of sticky rice flavors, such as traditional Cambodian sticky rice with coconut, a popular mango sticky rice, and a new bacon sticky rice. The sticky rice is pleasantly crunchy, but not in an undercooked way, and the mango tastes sweet and fresh. Drinks include the lemon ginger fizz and Thai iced tea. The latter tastes light, which I find rare. Now is a good time to taste a ramen burger. There’s no more daunting lines, but the burgers are still exceptionally savory and filling (despite a seemingly small size). The noodle patty is soft and the burger holds together surprisingly, and the shoyu sauce is drool-worthy. It’s always exciting to watch the Red Hook Lobster Pound employees blowtorch the surface of the lobster mac and cheese to create that warm cheesy melt. A notable dish is the Connecticut Roll, filled with lobster meat poached with butter. Their lobsters come from the Maine coast. The Salty Road is a Brooklyn company that makes salt water taffy. Owner Marisa Wu has been looking for a place to open shop ever since her successful Kickstarter campaign last September. So far she has had little luck. But for now, you can order her organic taffy on her website or visit the vendor stand at Smorgasburg. Wu is currently selling a special holiday taffy called the Snow Mint, which consists of salt water taffy made with organic peppermint oil. The salted caramel apple taffy is a must-try. One can’t help but notice the beautiful dark purple Chocolate Truffle at Krumville Bake Shop, a gluten-free, artisanal bake shop. The truffle is made with pink peppercorn-citrus ganache. And if you’re looking for gift ideas, a holiday DIY marshmallow kit from S’more Bakery sounds magnificent. Saturday and Sunday 10 a.m.–7 p.m.